A newly released image from the forthcoming, The Christmas Express episode has emerged in the United Kingdom. 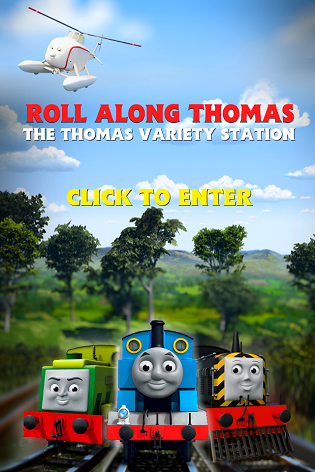 The picture was included in Issue 645 of the Thomas & Friends magazine, published on Wednesday July 18th 2012. It depicts the now confirmed to star, Toby, pulling Rheneas on a flatbed by the Sodor Search and Rescue Center. While Rheneas is in a cheerful state, the No. 7 steam tram, Toby utilizes a worried facial expression. The break in tradition of a standard gauge engine interacting with a narrow gauge engine in the Hit Entertainment timeline of the show, follows Paxton's already known activity in the Blue Mountain Mystery. The last to do so apart from Paxton and the usual Thomas, was James in the second feature-length special, The Great Discovery. The Christmas Express airs on Channel 5 milkshake! in the UK and on ABC2 in Australia in Christmas 2012.